With nearly ten years shooting weddings in Northern Ireland, we’ve had the privilege of being backstage at nearly every wedding venue here. There are now so many spaces where you can have a relaxed, informal wedding, and make the space your own. And the choice of venues keeps on growing! Tullyveery House is a fantastic venue if you’re planning an outdoor wedding in Northern Ireland. Perfect for ceremonies in the garden, with the rolling Co. Down hills in the background. Tullyveery House wedding on the blog. Of all the National Trust wedding venues in Northern Ireland, Mussenden Temple is probably our favourite. There’s something magical about the domed, circular space perched on the cliff edge. Downhill beach, below the Temple, is a great spot for a few quick portraits. Mussenden Temple wedding on the blog. Just outside Bangor, the Clandeboye Estate and Courtyard feels like a world of its own with woods, gardens, a lake and a huge amount of hidey holes to nip off to for photographs. The little stone chapel is the perfect place for a religious wedding ceremony, and there’s a great courtyard for non-religious wedding ceremonies. The big barns are brilliant for medium to a larger size wedding receptions. Clandeboye Estate and Courtyard wedding on the blog. Beech Hill is an amazing spot for a Derry wedding. The food is gorgeous, there’s a laid-back vibe in the House, and there are so many fab places to explore in the grounds. A great option if you want a wedding venue where families and friends can stay overnight on site. Beech Hill Country House wedding on the blog. Home of so many great gigs over the years, the Ulster Hall in Belfast city centre is a dramatic space for a wedding ceremony. This venue is all about the lighting and staging, and the building itself is a complete knockout. There are so many great restaurants and pubs on the doorstep for a reception afterwards. We were lucky enough to shoot the first ever wedding there! Ulster Hall wedding on the blog. There’s something special about a wedding in Belfast’s cathedral quarter, the cultural heart of the city. And the Merchant Hotel ticks all the boxes. You can have your ceremony in the hotel, the food is amazing, and portraits are a dream, 30 seconds in any direction and you’re standing beside some world-class Belfast street art. Merchant Hotel wedding portraits on the blog. Sticking with Belfast wedding venues, the Queens Film Theatre is a stunning and unusual place for a ceremony. You have full use of the screens, stage and bar. If you want to integrate film into your wedding ceremony, or even if you don’t, the QFT is a top option. Queen’s Film Theatre wedding on the blog. Drenagh House near Limavady in County Antrim is probably best known for its beautiful moon window. A kind of wedding portal where you step through into your ceremony. The House itself is gorgeous. Think walls of books, strong colours, eccentric stately home decor. Drenagh House wedding on the blog. Set in a huge estate near Ballynahinch in Co. Down, the Carriage Rooms at Montalto is a one of the leading wedding venues in Northern Ireland. Think glamorous garden party wedding or a sophisticated dinner party. Definitely a good choice if you’re after a wedding that’s elegant and easy to organise. Larchfield Estate is where we got married! Just outside Lisburn, it’s really close to Belfast and easy to get to. You can have an outdoor wedding in the garden, inside the barn if it’s raining, and there are so many nooks and crannies for amazing photographs. A great option if you want your full wedding day to take place in the one venue. Orange Tree House is a gorgeous stone barn on the shores of Strangford Lough. You can get married in the old chapel on site, or use the barn as a reception venue. The wild Co. Down coast can make for some dramatic photographs, especially if you stake out the good light. The ruins of Greyabbey are a few minutes away if you want sneak off for some portraits. Orange Tree House wedding on the blog. 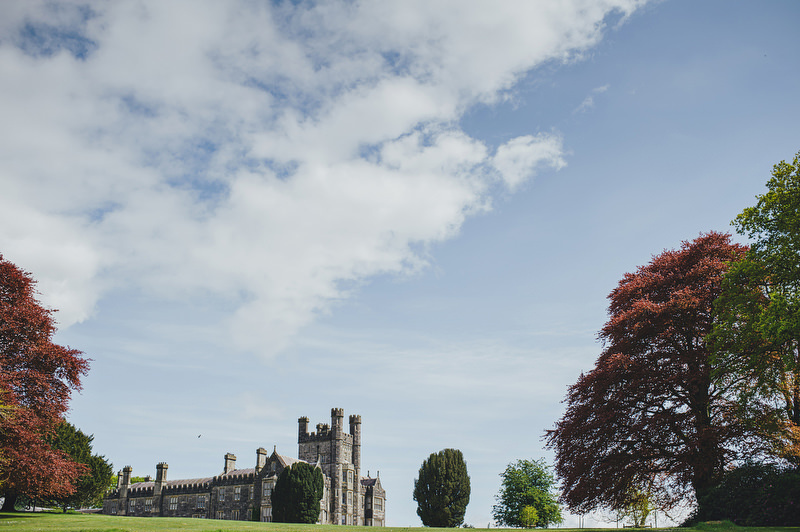 There’s something a bit special about the idea of an Irish Castle wedding. And Crom Castle in the Country Fermanagh hits the spot. It has rolling parkland, woods, a Victorian conservatory, a boathouse… You can have religious or civil ceremonies in the Castle. And also a small house party in the West Wing, if you want to spread things out over a few days. Crom Castle wedding on the blog. Another great option for a castle wedding in Northern Ireland is Belle Isle Castle in Fermanagh. It’s a slightly smaller venue, but hidden and wild, with loads of cottages for guest accommodation. Belle Isle Castle wedding on the blog. Cultra Manor and The Ulster Folk Museum together make a great play-park of a wedding venue in Holywood, Co. Down. Depending on numbers, you can get married in an old meeting house, chapel, or a school-house… and have your reception in a dockside gallery, Cultra Manor or the Belfast room. So many options for photographs and exploring for guests. Cultra Manor wedding on the blog. Old Court Chapel is a beautiful new wedding venue on the shores of Strangford Lough. There are restored stables, a yurt type marquee, a stone chapel for your ceremony - basically a peaceful hideaway where you can have a private party. It’s beautiful as it is. And there’s also plenty of scope for you to customise the space so it reflects your personality. We’re shooting our first two weddings here in a few months - can’t wait! If you want to get off the beaten track, Finnebrogue Woods is the wedding venue for you. Set in the heart of woodland near Killyleagh and Downpatrick, with giant tipis, loads of space and a free hand to design your perfect wedding.